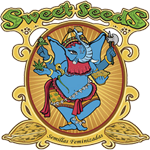 Sweet Seeds is a modern seed bank specializing in the recruitment and retention of new lines feminized cannabis high quality, including varieties auto flowering. All varieties of Sweet Seeds are especially sweet, aromatic and palatable. Their genetics are fully adapted for both the requirements of the crop outside and inside with artificial lights. Easy to grow varieties, productive and very aromatic. Sweet Seeds Seeds are selected one by one manually, after a thorough inspection only the best seeds are packed. The conservation of seeds is carried out under conditions of low humidity and low temperature, thus ensuring the best preservation of their viability, as our seeds are packed in the test have passed the germination viability of 95%. Seeds Sweet Seeds have a femininity that is around 99.7%.